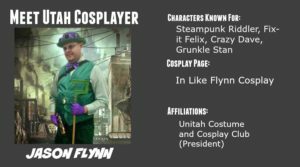 The fourteen profiles I’ve collected–seven to be shared in this post, seven in a later post around Halloween–are a sampling of the different kinds of cosplayers that live and work right here in Utah. Some of them are my personal acquaintances, and a few are even my good friends. 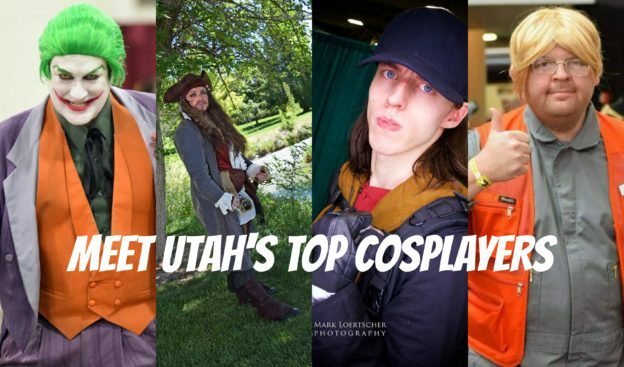 Utah’s cosplay community–the geek community in general–is special because it brings together people from different lifestyles, beliefs, and backgrounds to build each other up through a common interest. This week, our spotlights include Stephen McGarity, Benji Seekins, Missa Zane, Jason Flynn, Eric Allen Hall, Brittany Wilson, and Hannah Oberle. 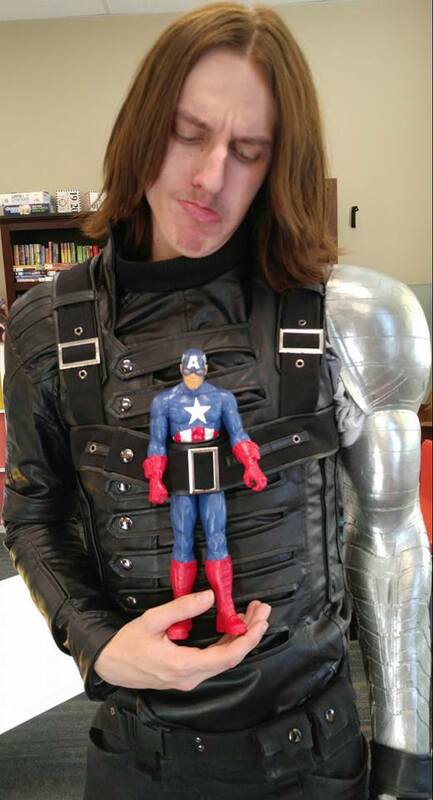 I’ve known Stephen for as long as I’ve been in Kids Heroes. He’s a great guy and loves coming out to volunteer. He does other characters, but his go-to is Batman. 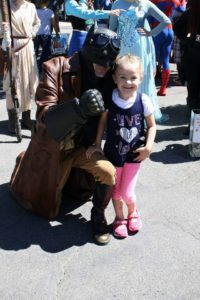 When the Kids Heroes Foundation has an event, chances are Utah’s Batman will be there. Benji: I was in a Marvel group on Facebook and asked everyone who they think I should cosplay from the Marvel Universe and most of the comments were the Winter Soldier because I had some resemblance to Sebastian Stan. 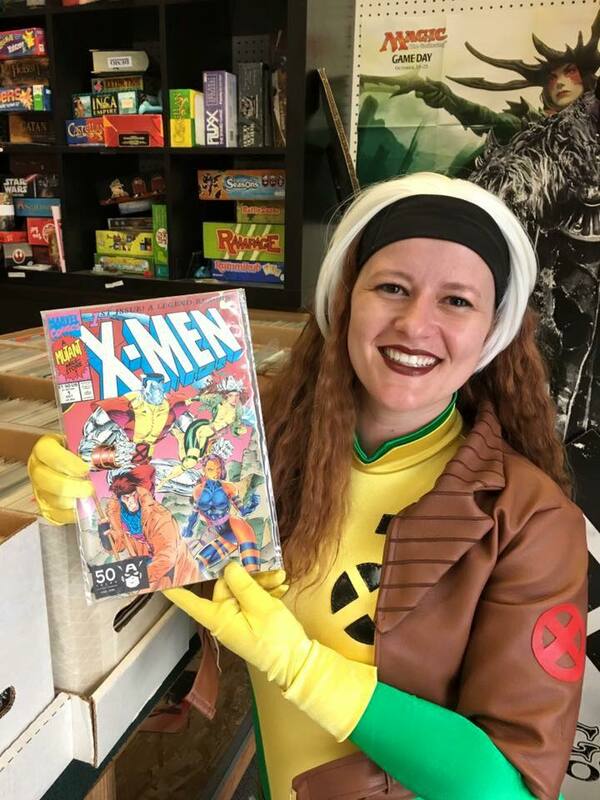 Brittany: I have always loved dressing up but my love of cosplay came after I realized that I could use it to help with charity. 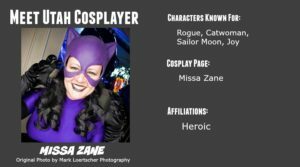 After battling Stage 3A Melanoma and going through 12 months of chemotherapy and two major surgeries; I found myself in need of a some extra added financial support. 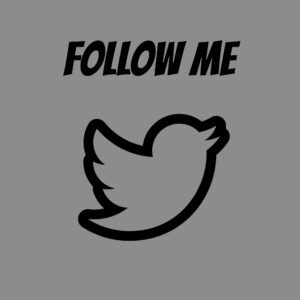 A fundraiser was set up for me and after all of the support I received from the community I determined that I was going to beat cancer and strive to pay it forward. Now I go to charity events to help raise funds for other people in need and I love every second of it! 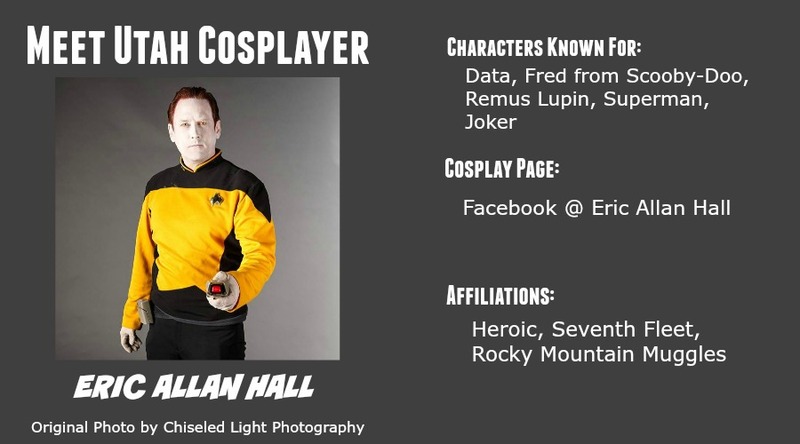 Eric: I grew up doing community theater with my mom, so I learned about costuming and makeup from an early age. I have always loved Halloween, and I made a robot costume out of empty bleach bottles, drier hose, and cardboard boxes when I was in the fourth grade. 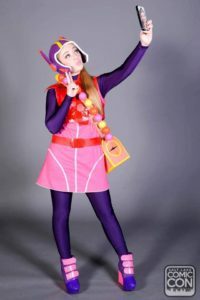 After college, I started to do big group Halloween costumes with my friends, and I kept going as I started to attend Star Trek and other scifi and fantasy conventions starting in the 90’s. 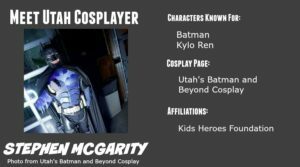 Hannah: My dad and I have loved making me costumes every Halloween, but really got into cosplay at the second Salt Lake Comic Con in 2014. My younger sister is also my partner in cosplaying, so it’s fun to do partner cosplays. 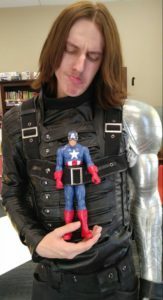 We’ve done Mina and Zelda, Thor and Loki, we’re working on Black Widow and Winter Soldier; it’s fun to cosplay together. What Gives You the Most Satisfaction in Cosplay? Brittany: Seeing the smiles on the faces of those in need of an extra hand, hearing a laugh, or even the feeling that in that very moment they are completely free and happy. The fact that in some cases we are able to help financially is the cherry on top! Hannah: When people want pictures with me and ask if I made it. Telling them I did is really satisfying! I also love when people seek me out of huge crowds to meet me or tell me they recognize me from another cosplay. Missa: Seeing a costume come together then seeing how excited people are! 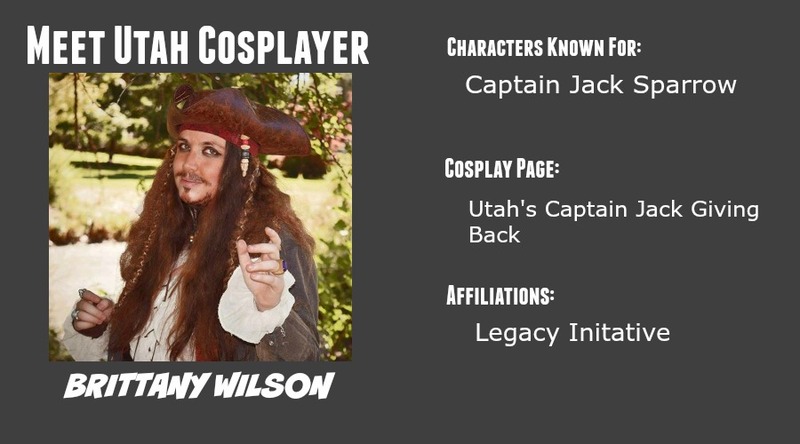 Brittany Wilson is Utah’s Captain Jack. 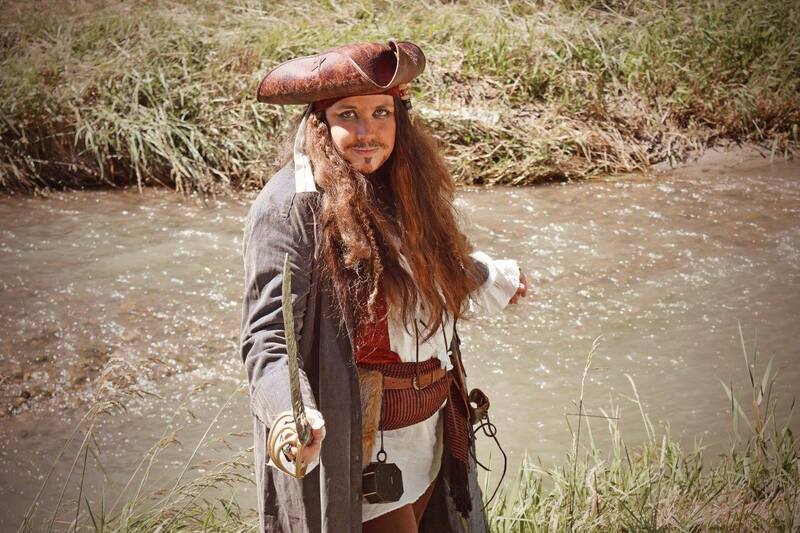 Over the summer, the Orem Owlz baseball team had theme nights and invited cosplayers to come mingle with the fans. 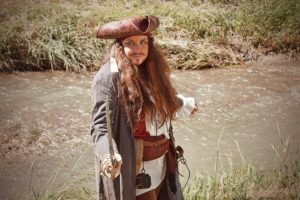 When they did their Pirates of the Carribean night, Brittany didn’t hesitate to drive down all the way from Ogden to Orem to come to the game, and she was over-the-moon about my Elizabeth Swann costume. 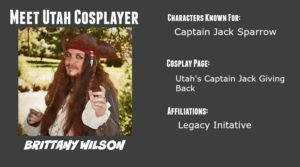 At Salt Lake Comic Con, Brittany brought a Jar of Dirt, complete with the heart of Davy Jones, to display at the Legacy booth and share with friends. I met Eric Hall my first time at Comic Con, back in 2014. 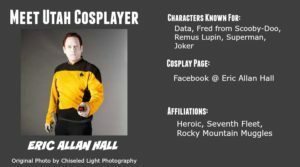 As it turns out, Eric is a local cosplay legend, who sports literally dozens of costumes and makes some for his kids, too! 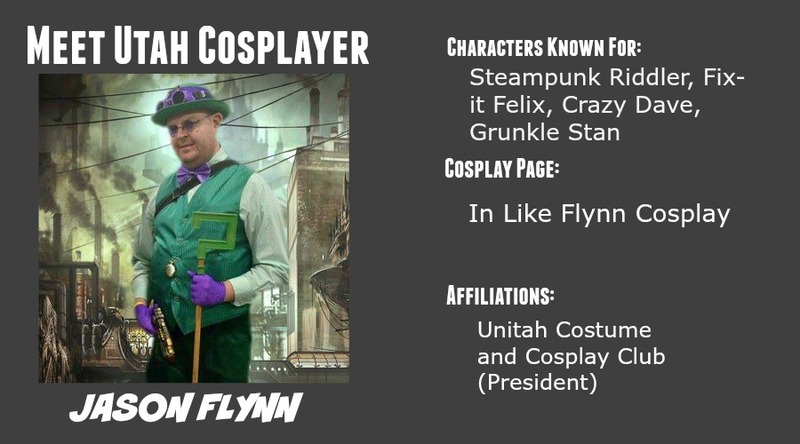 But he is also a great friend to everyone in the cosplay community, always willing to give advice and help other people make their costumes. We’ve run into each other a handful of times in person. Once was when Heroic and Kids’ Heroes teamed up for a charity event in Salt Lake. There was live music playing in the background, and Superman asked Scarlet Witch to dance with him for a few minutes–unexpected, but fun. 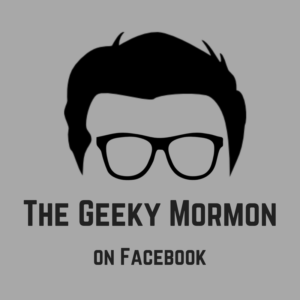 Brittany: The best advice I have to give is this; be kind to those you meet in this community. 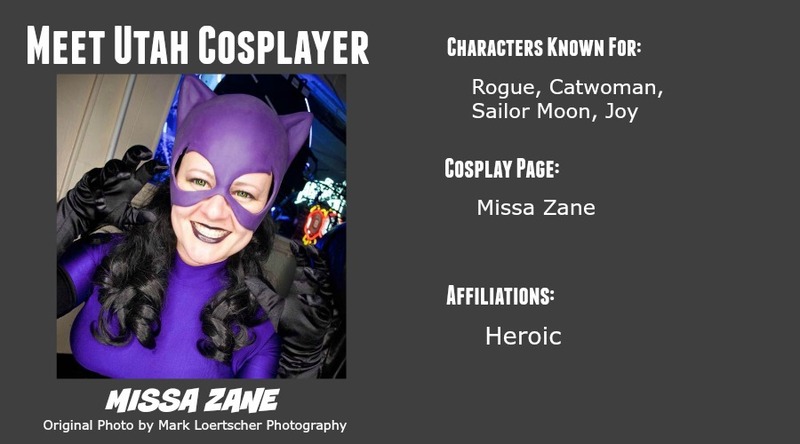 You never know what the person behind that makeup, mask, or cosplay is battling. That armor they wear and sword they carry might be battling much more that that of fiction. 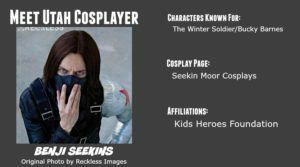 Eric: Philosophical advice: It’s good to accept feedback from others, but stay true to your vision of the character as you construct your cosplay and as you bring your character to life. 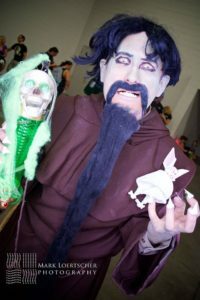 Practical advice: Shop thrift stores frequently for clothing, shoes, belts, hats, and toys and props you can use or alter for your cosplays. 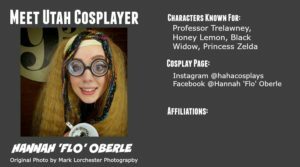 Hannah: Don’t be afraid to try an advanced character! There’s always creative ways to make pieces with the simplest of materials! My Zelda armor is made out of foam, caulking, modeling magic clay, and gold paint. 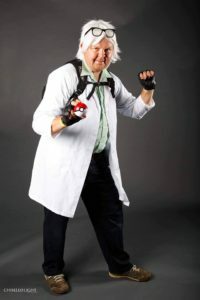 Also don’t let gender, size, age, race, or anything like that stop you from cosplaying your favorite character. Missa: Just dive in ^_^ push your limits. 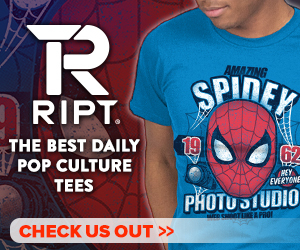 We are our worst critics and that will hold you back from a world of fun!